San Diego has long been one of the best cities for dining in, with new restaurants popping up with fresh concepts almost weekly. But with so many things going on and so many innovative ideas all over the place, it can be hard to tell the differences between culinary genius and tasteless gimmicks. So you can keep well clear of the places that aren’t worth your time and spend more of your visit indulging in the amazing style of cooking and fresh seasonal ingredients that the city's chefs pride themselves on, we’ve put together a list of the top 10 restaurants in San Diego, covering everything from Italian classics and sustainable seafood to new American eats and Mexican dishes. The scene: Opened in the summer of 2016, Ambrogio15 is a relatively new restaurant which specialises in Milanese-style pizzas. The three owners all hail from the Italian city and have carefully perfected their recipe for wafer-thin pizza crusts unlike anywhere else you’ll find in the city. In addition to a great choice of authentic Milanese pizza flavours, the menu features thick and thin gourmet focaccia, antipasti, salads, cheeses and cold cuts. There’s also a wonderful selection of house-made desserts, inspired by the offerings of a renowned artisan pastry shop in the heart of Milano, and plenty of local craft beers and Italian wines sold by the glass and bottle. 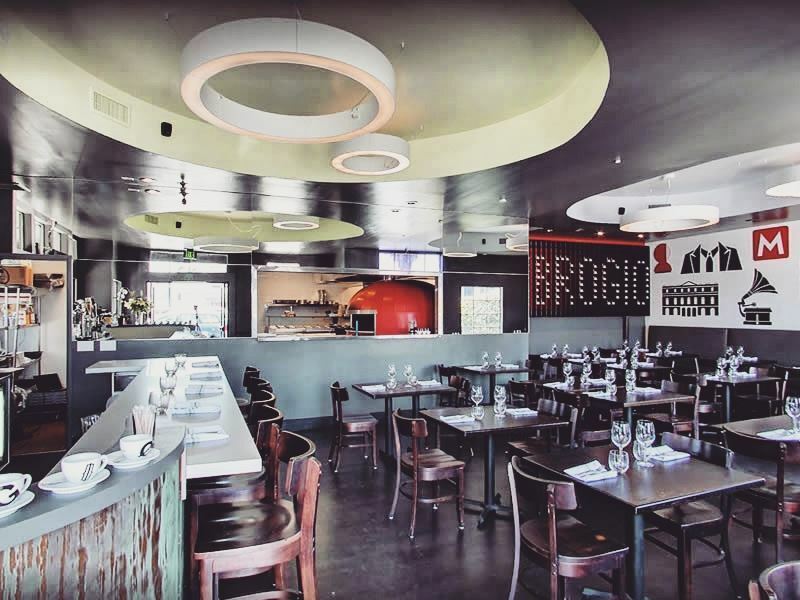 Unlike most Italian pizzerias in San Diego, Ambrogio15’s décor is refreshingly modern, with eye-catching black and red motifs on clean white walls, chic black tables and a huge red wood-fired pizza oven. There’s also a small patio area at the front of the restaurant, perfect for al fresco dining when the weather’s warm. Signature dish: Margherita pizza made with a super thin crust, house-made tomato sauce, mozzarella and fresh basil. You can take it up a notch by adding buffalo mozzarella or 18 month aged prosciutto for an extra charge. The scene: A wine lover’s dream, The 3rd Corner offers a unique dining experience that combines a late-night Californian bistro with a top notch wine cellar. 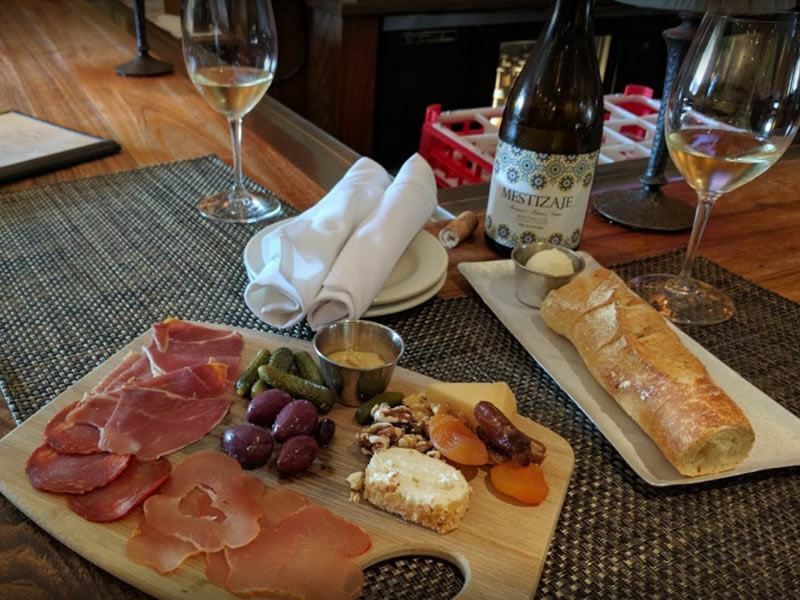 Upon entering you can choose your bottle of wine from a staggeringly large selection of reasonably priced labels and pair it with amazing California-inspired small plates for a $5 corkage fee. 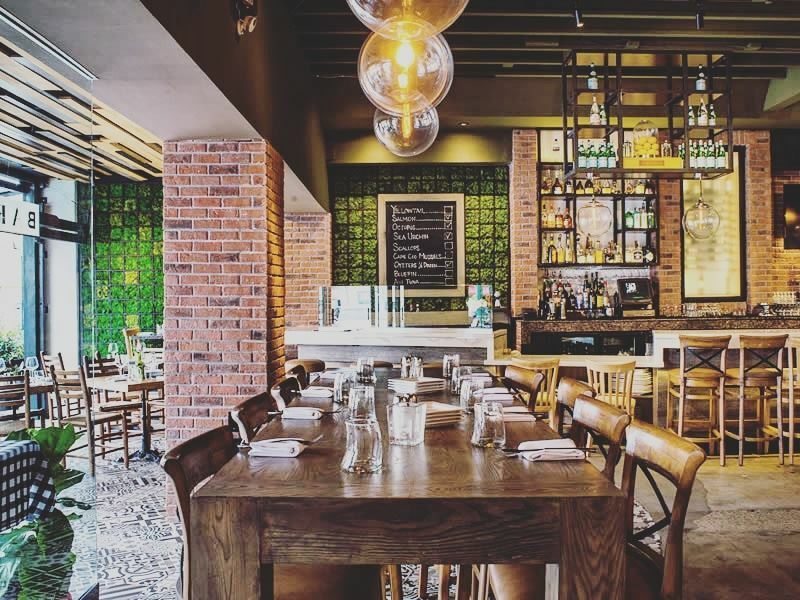 The cosy and unpretentious surroundings with exposed wooden beams and wine crate decorations go perfectly with the non-standard way of the restaurant and the bistro-style menus. From family to-go, prix-fixe and wine dinner menus to standard a la carte and late night menus (the restaurant serves food until 1am between Tuesday and Saturday) you’re certain to find something to suit your group and budget. Dishes vary widely between the menus, but expect to see typical bistro food, like New York strip steak, duck confit, seafood risotto and wild mushroom pasta. The weekend brunch with bottomless mimosas deserves a special note and is definitely worth getting up for, with 16 different gourmet dishes on offer. Signature dish: The free range pan-roasted chicken is a must-try, served with potato gnocchi, seasonal vegetables and lemon chicken jus. The scene: Owned by the Busalacchi family who are famous restauranteurs in the city, Barbusa is a modern Sicilian trattoria with an upbeat, buzzing atmosphere. The décor is modern and contemporary with pop art posters, funky lighting and tall bar-like seating, but the service is reliably old-school with plenty of care and attention paid when taking orders. The menu is bursting with Italian classics, from typical antipasti dishes for sharing and simple yet flavourful salads to a plethora of pastas, house-made pizzas, fish courses and meat dishes. 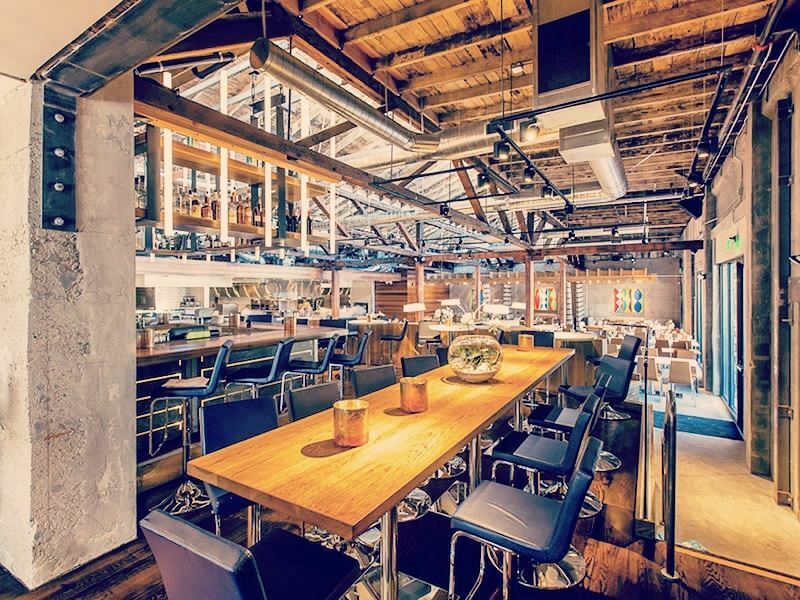 There’s even a crudo bar with a daily-changing selection of fresh seafood to choose from. If you’re stuck for what to order, try the pasta. It gets stellar reviews (especially the Funghi e Tartufo – casarecce pasta served with truffle oil, oyster mushrooms and pecorino cheese) and it’s all made entirely from scratch every day. The food and drink prices are remarkably reasonable, considering the area, surroundings and sheer quality. Signature dish: The 20oz Sicilian bone-in ribeye steak, rubbed with Sicilian seasoning and served with onion rings. The scene: Set inside a former 1,100m2 art warehouse, Herb & Wood is a multi-space restaurant divided into four separate zones. The chic loft-like lounge area is the first to greet guests before they continue on to dine in the Lavender Lounge with an outdoor porch atmosphere, the Paris meets NYC feel of the Main Dining Room or the Patio with a double-sided fireplace and comfy seating. The food strongly focuses on delicious proteins and seasonal vegetables prepared in their wood-fired oven, resulting in plenty of mouth-watering dishes. Roasted half chicken with smoky braised kale, roasted leg of lamb with couscous and apricots, seared Alaskan habit with morels and grilled Iberico pork “secreto” with apple mostarda taste even better than they sound. The extensive menu is changed regularly according to what’s in season, so although the side dishes and dressings can vary, the fantastic cuts of meat and fish are always the same. To complement the food, there is a wonderful choice of cocktails, wines and beers from all over US and further afield. Signature dish: Branzino stuffed with Meyer lemons, parsley, chives and chervil, all wrapped in serrano ham and roasted before being topped with a chilli tapenade comprised of Castelvetrano olives, Calabrian chillies, garlic and shallots. 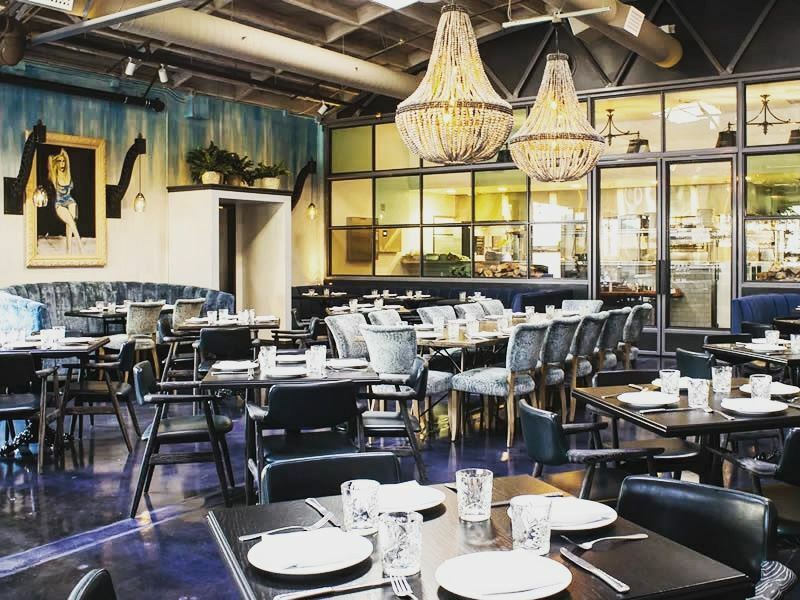 The scene: The trendy Juniper & Ivy gives the owner, Top Chef TV show winner Richard Blais, the chance to showcase his inventive take on New American cuisine, with awe-inspiring dishes that play with molecular gastronomy. 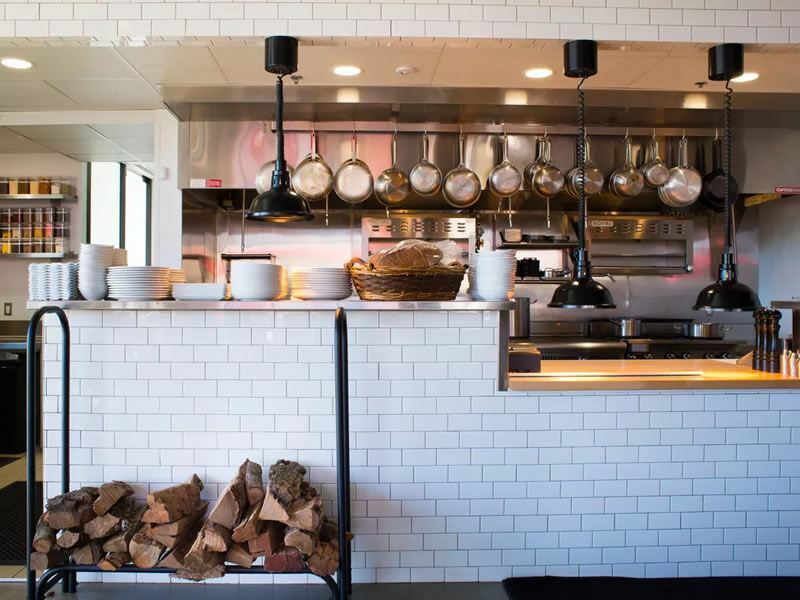 Despite the cool cuisine and hipster crowd, the restaurant manages to stay away from feeling pretentious, instead focusing more on attentive service and maintaining the happy, lively atmosphere that it’s become known for. The open kitchen gives diners a first-hand view of the action while browsing the menu laden with interesting twists on classics. There are small snack-like plates (the foie gras cookies are a must) and raw seafood to start, followed by exciting pasta dishes and inventive open-faced toasts. The main courses are dominated by small plates meant for sharing (a special shout out goes to the beef tongue teppanyaki served with radish snow) and larger individual plates like dry-aged ribeye served with broccoli mac and cheese. Signature dish: Yodel: an indulgently rich dessert made from devil’s food chocolate cake, smothered in a white chocolate sauce, topped with sweet hazelnut brittle and served with thick and creamy hot chocolate. 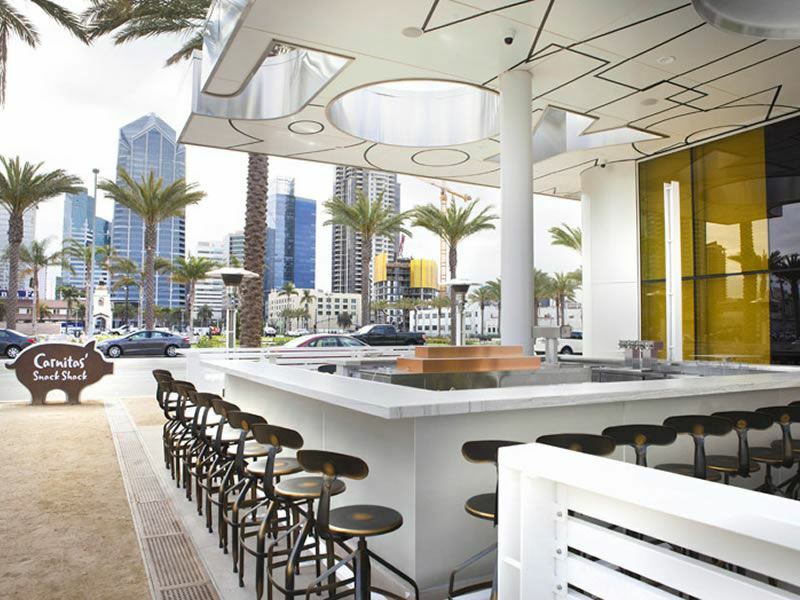 The scene: Boasting three locations in San Diego, the Embarcadero edition of the restaurant chain is located at North Harbour and comes with some exciting new changes. There’s a granite-topped outdoor bar which serves draught beers and wines, plus loads of speciality cocktails made with local spirits – a first for Carnitas’ Snack Shack. All the seating is outdoors in an al fresco communal dining space which can seat up to 50 people and there are two walk-up windows where you order your food, adding to the laid-back casual feel. The menu is inspired by central American cuisine, with slow cooked pork being highlighted in many dishes. Popular favourites like the triple threat pork sandwich (pork loin schnitzel, pulled pork and bacon) and the Snack Shack burger (with lettuce, tomato, bacon jam, white cheddar and shack aioli) are plated up with mind-blowing sides like seasoned fries with bacon ketchup and shack chicharrons (pork scratchings with spicy avocado hot sauce). Signature dish: Pork belly app: braised pork belly smothered in a sweet and spicy glaze served with a friseé salad, apples, radishes and a lemon vinaigrette. The scene: Specialising in family-style dishes that cover a huge range of international regions, bold flavours and inventive cooking styles, Trust Restaurant aims to serve tasting menu-quality cuisine without any of the stuffy, grandiose atmosphere you usually get in such places. Exposed metalwork on the ceiling, brick-fronted bars and simple wooden seating create a modern, friendly feel perfect for enjoying a casual brunch, lunch or dinner as friends or family. Described as urban rustic food with a wood-fired flair, the menu is simple and divided into farm, ocean and ranch sections, so you can hone in on your favourites without studying the dishes for hours. On the menu, the Greek herbs in the wood-grilled lamb meatballs with tzatziki rub shoulders with the Italian flavours in the ricotta agnolotti served with black garlic streusel and the American seasonings in the wood-grilled burger with bacon-tomato jam, resulting in an eclectic mix of dishes from all over the world. Signature dish: The hush puppies, made with 60-day aged homemade ham, house-cultured honey butter and sea salt. The scene: One of the finest upscale restaurants in San Diego, Truluck’s Seafood Steak & Crab House serves the freshest seafood in the city, sourced directly from the restaurant’s very own fisheries. 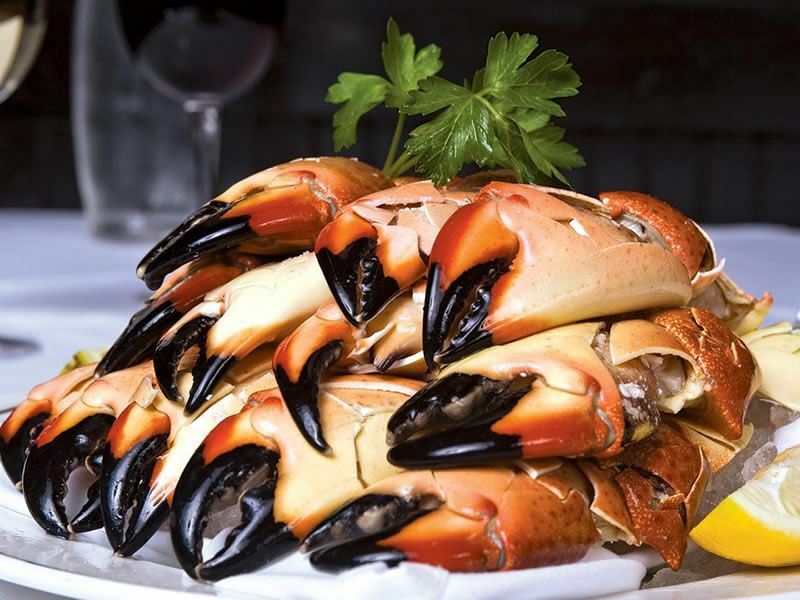 The menu featured delicate cold starters like fresh Florida stone crab claws with in speciality mustard sauce, as well as hot starters like the delicious salt and pepper calamari dressed in a sweet Vietnamese chilli sauce. The main courses are just as enticing and include the likes of miso-glazed seabass and South African stuffed lobster tail served on a blue crab cake. But it’s not all about fish and seafood. There are plenty of gourmet steaks on offer, too, to satisfy carnivores with hearty appetites. The décor is exactly what you’d expect from a fine dining restaurant with a business casual dress code. Large circular tables draped with white fabric tablecloths dominate the room while servers dressed in shirts and ties attend to the tables and someone plays a tune on the black grand piano in the corner. Signature dish: Lobster mashed potatoes for sharing: a huge pile of rich, creamy mashed potatoes stuffed with parmesan cheese and fried onions, all topped with buttery lobster tails. The scene: The Lodge’s signature restaurant, A.R. Valentien specialises in fresh, regional San Diego food served in an elegant and sophisticated timbered dining room overlooking the 18th hole of the Torrey Pines golf course. The building is a dedication to craftsman architecture and Californian heritage, with a post-and-beam metal-strap structure, handcrafted wooden window frames, stained-glass lanterns and a detailed frieze painting providing you with something interesting to look at wherever you glance. The menu takes inspiration from the highest quality local produce available throughout the seasons and therefore changes regularly according to the offerings of local farmers, ranchers and fishermen. A huge emphasis is placed upon using simple ingredients and minimal handling to highlight the flavours and textures already in the ingredients. Classic favourites such as 28-day dry-aged prime New York strip steak served with caramelised vegetables, prosciutto-wrapped monkfish with ozette potatoes and apple wood-smoked pork chops with house-made sauerkraut regularly appear on the menu, but they’re not guaranteed. Signature dish: The seasonality of the menu means there’s so signature dish, but the tasting menu with wine is always a stellar choice, showcasing the chefs’ incredible talents and San Diego’s superb fresh produce. The scene: San Diego is in no way short of excellent Italian restaurants, but Parma Cucina Italiana clearly stands out above the rest. 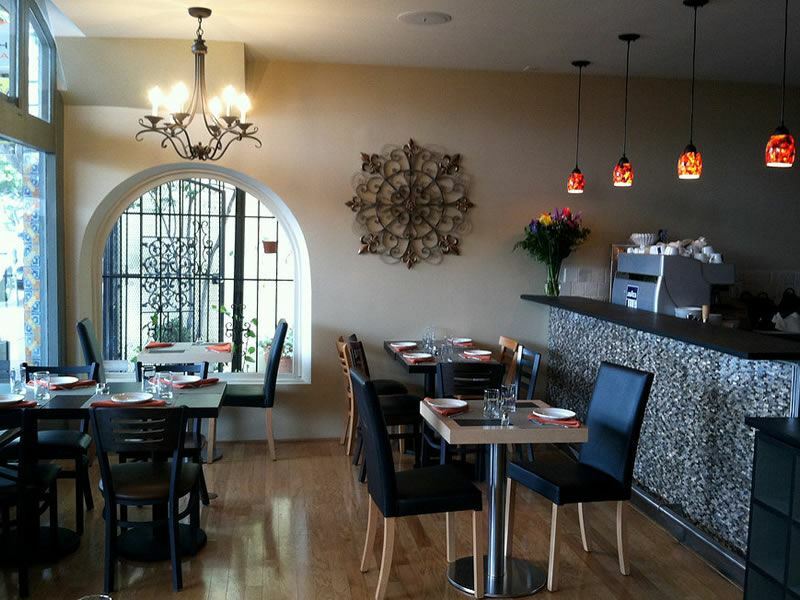 Serving authentic northern Italian food with “amore”, this hugely popular restaurant is run by a husband and wife duo with 30+ years of experience running restaurants in Italy. The menu features all the classic Italian dishes you’d expect to see, from mouth-watering antipasti sharing platters and house-made pasta dishes to flavour-packed meat main courses and fresh, healthy sides. The specials change on a daily basis and are always worth a try. To complement the food, there’s a superb international wine selection, with almost all labels available by the glass or bottle, as well as delicious Lavazza coffee. 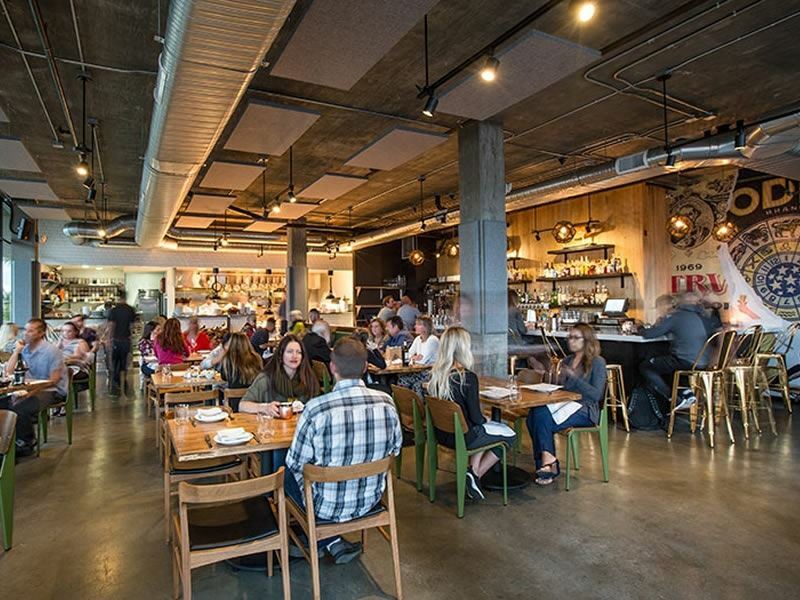 Although it’s small, the restaurant makes the most of its space. Floor-to-ceiling windows create a bright and airy dining space with polished wooden floors, white-washed walls, cool black furniture and plush sofas piled high with cushions where you can wait for a table to free up. When the sun is shining, the small outdoor dining space at the front of the restaurant is a great place to enjoy a glass of prosecco or the risotto of the day. Signature dish: Lasagna served with a traditional béchamel and house-made meat sauce.